Peckham Rye, bread baked by Brick House in East Dulwich, has been named The Londoners’ Loaf in a contest organised by the food and farming charity Sustain’s Jellied Eel magazine and Real Bread Campaign. The competition was created as a showcase for the growing number of bakers bringing additive-free loaves to the hearts of local communities around the capital. The award was presented at the launch of The Real Bread Festival. “Pretty much perfect bread in all sorts of ways,” said judge Lucas Hollweg of The Sunday Times Style magazine, describing the winning maslin (rye and wheat) sourdough loaf. “It looks so beautiful that you just have to break it open,” enthused fellow judge Diana Henry of The Daily Telegraph. “It delivers on everything its looks promise,” said The London Evening Standard’s food editor Victoria Stewart. 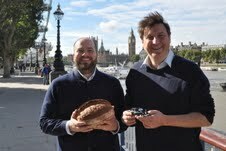 “London is lucky to have seen Real Bread boom in recent years,” said Jellied Eel magazine editor Ben Reynolds. “More and more people with a real passion for good, honest food have said “enough of pappy factory loaves” and begun making delicious Real Bread with nothing to hide available to fellow Londoners from high street bakeries and even their own kitchens,” said Campaign co-ordinator Chris Young. Brick House was launched by Fergus and Sharmin Jackson earlier this year and still only bakes around 400 loaves a week for local shops, cafés and a weekly stall at Herne Hill Market. As well as the glory of having Peckham Rye named The Londoner’s Loaf, the bakery also wins major features in the October issues of The Jellied Eel and the Real Bread Campaign’s True Loaf magazine. The Londoners’ Loaf trail began back in June, when The Jellied Eel magazine and Real Bread Campaign extended an open invitation to all London bakeries to enter the finest of their artificial additive-free loaves for the public vote. During July and August 2012, 1,172 Londoners chose between the 20 real breads entered. The 10 loaves with the most votes then went forward to a blind tasting at Borough Market by London-based food writers Diana Henry, Lucas Hollweg and Victoria Stewart.